Going to get the JP MegaDrive version later this year. Which is also very tempting and surprisingly a lot more expensive! 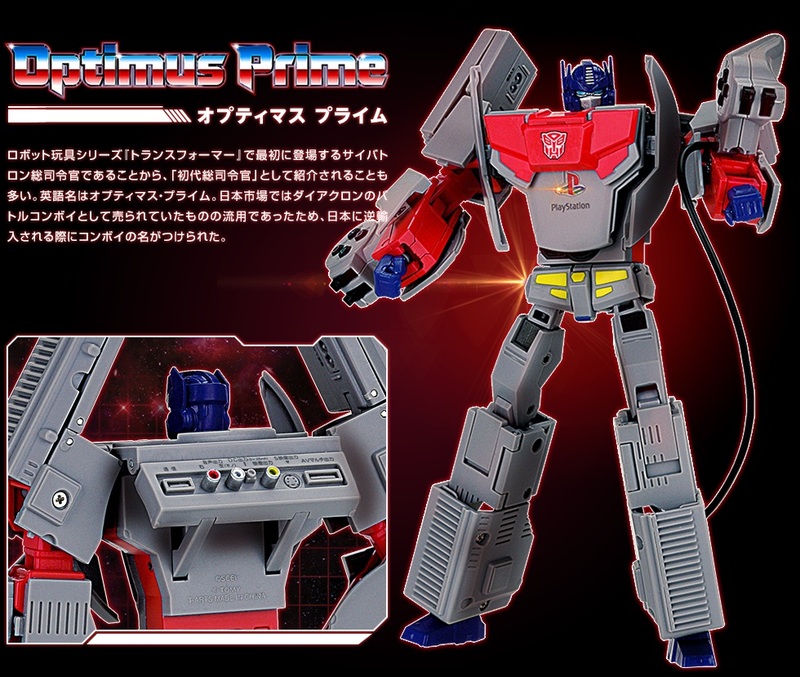 I've thought about getting the Optimus at least - I collect Optimus Primes, and this guy would be an interesting novelty, like Alternator & Alternity Prime (pickup truck and car respectively) and Optimus Exprime (bullet train/dragon). 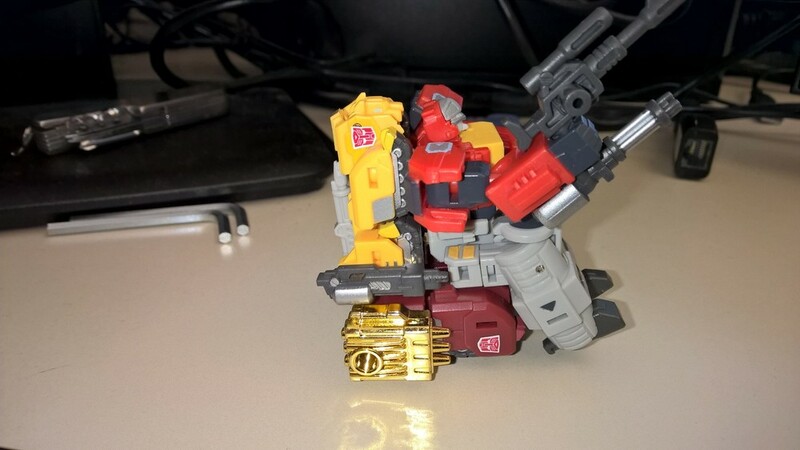 3rd party Blaster figure, sitting on his minions in their comm chair mode. 3 Kabaya model kits, basically licensed miniature DIY versions of the figures. 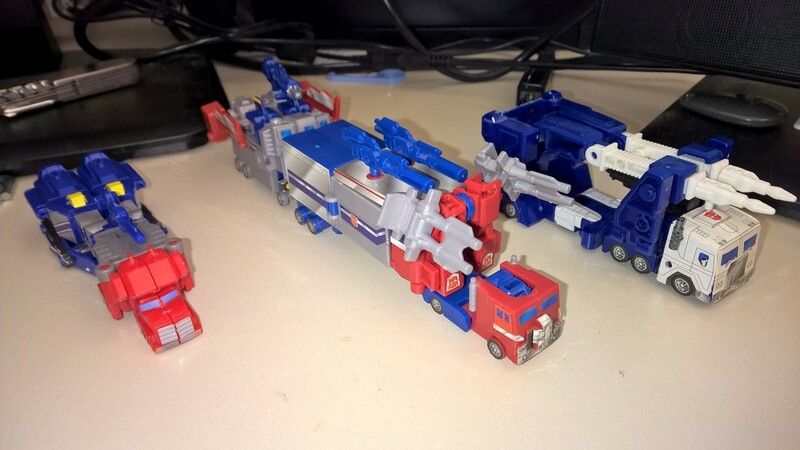 All of them are inspired by Convoy/Optimus Prime, though only one is actually Prime. 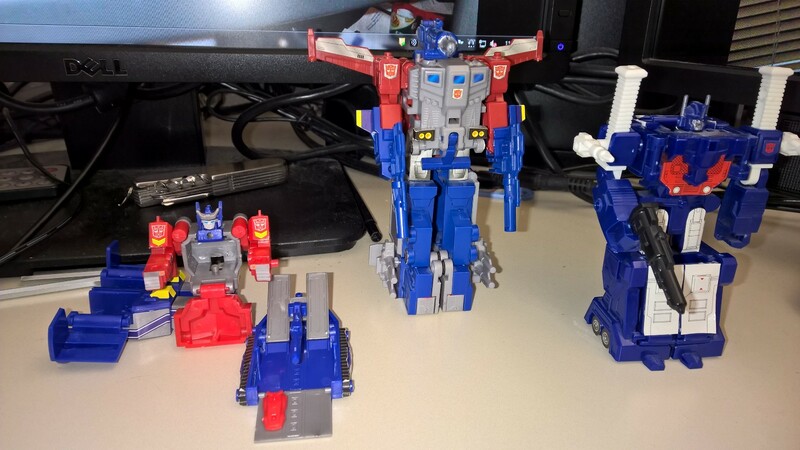 Star Convoy (Japanese-only Optimus Prime) on the left, God Ginrai in the middle, Ultra Magnus on the right. 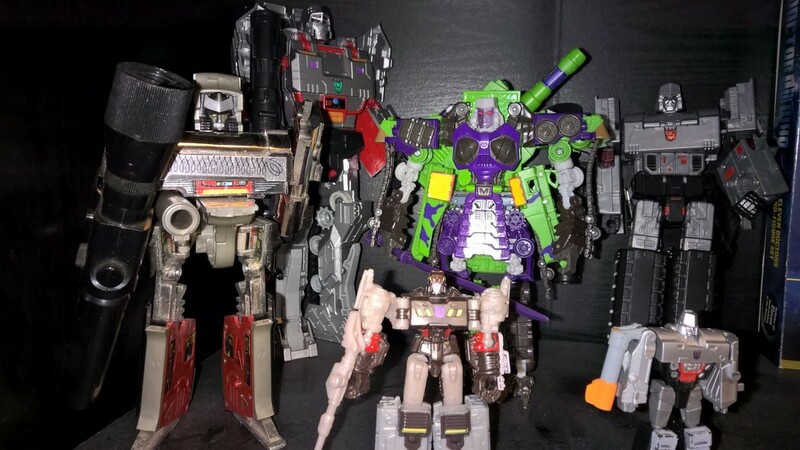 Same three in robot mode. Despite appearances, the middle guy is not Optimus Prime! 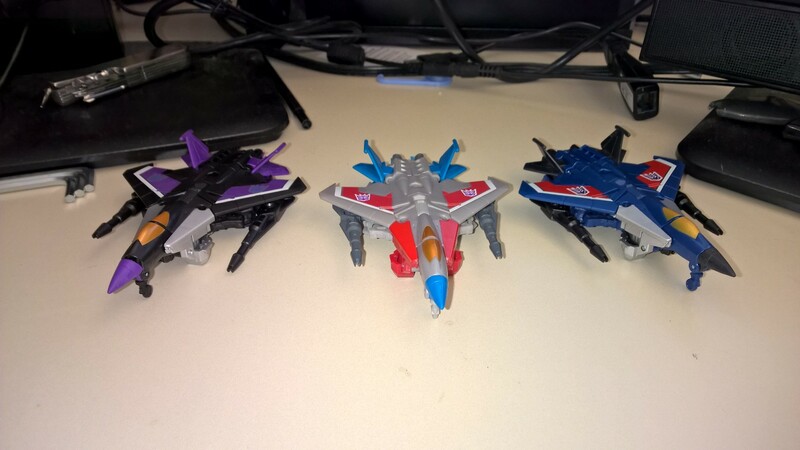 Same three, with third modes. 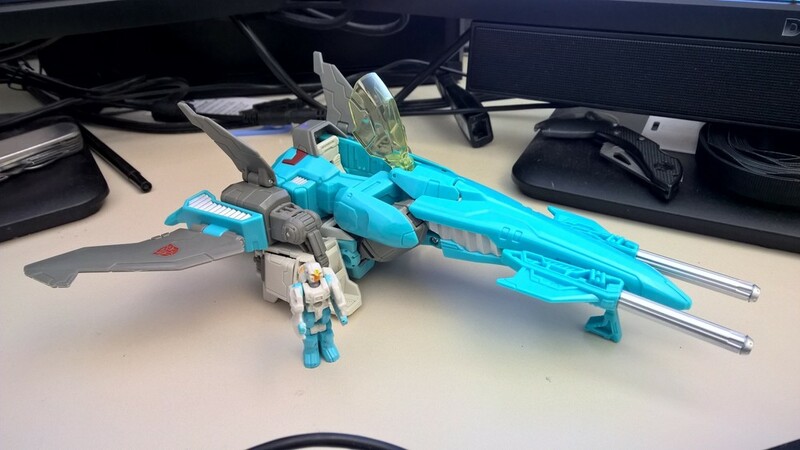 Star Convoy retains the base mode of the full-sized figure, with little simplification. 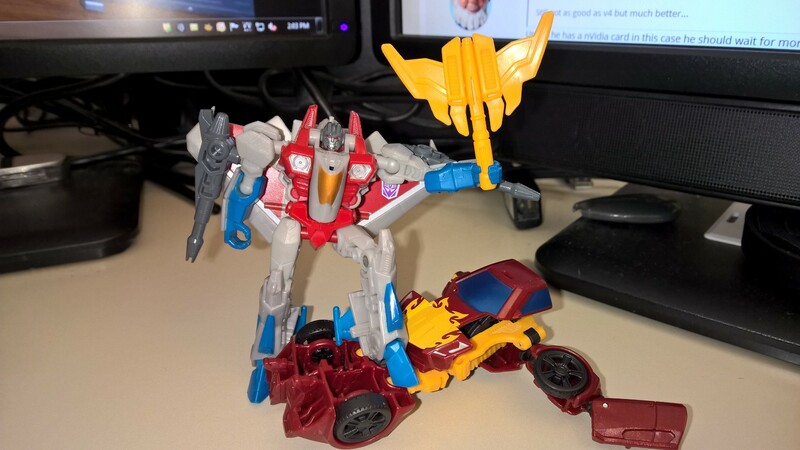 The little red Chicklet on his ramp is actually a ludicrously small Hot Rod, non-transforming of course. God Ginrai is now in his full super robot mode, with his 2nd trailer, Godbomber, adding height, armor, a shoulder cannon and flight capability. And Magnus is just awesome without a 3rd mode. Not bad for tiny model kits you get with gum! Legends class Seekers. 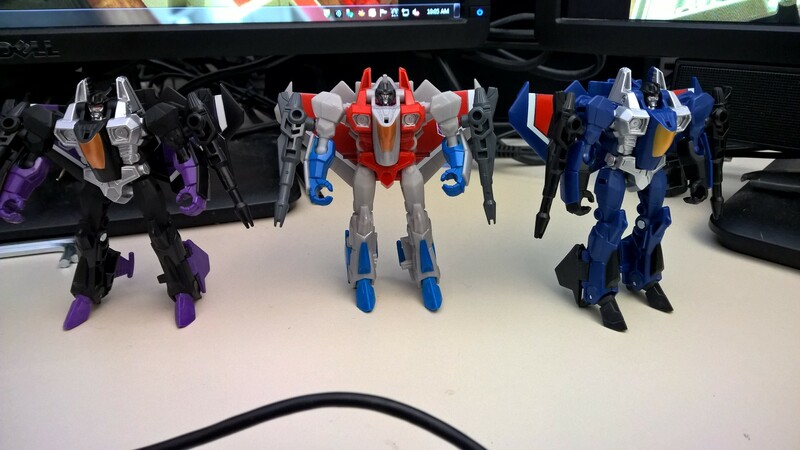 Skywarp, Starscream and Thundercracker. 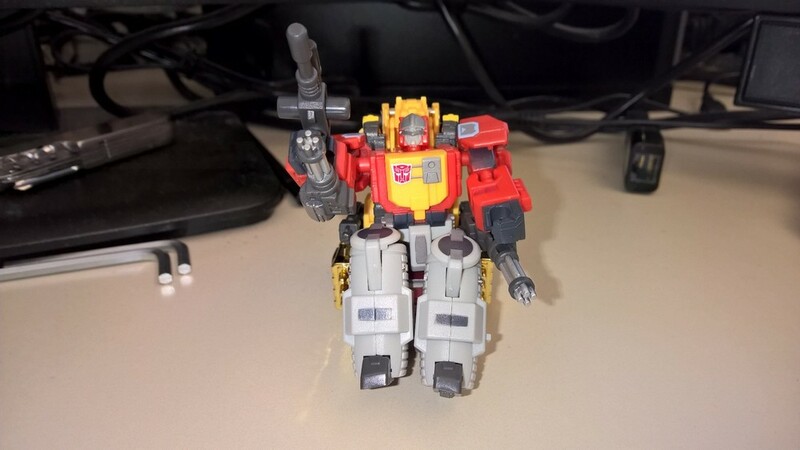 Transformed - wait, where's his head? 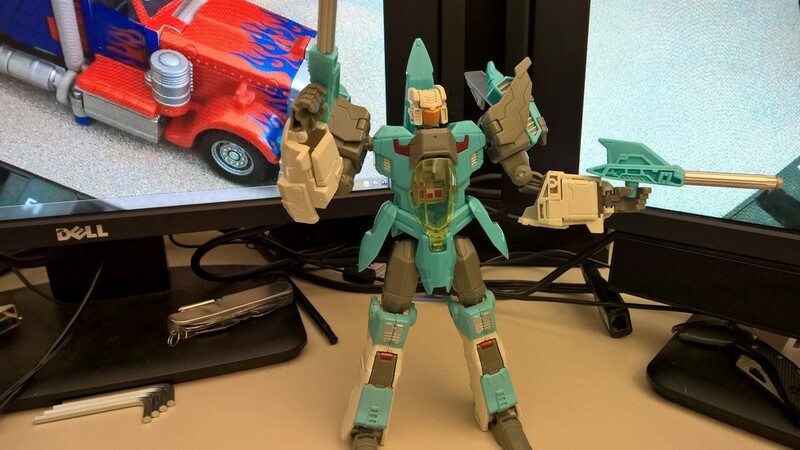 Brainstorm is a Headmaster, with Arcana forming his head. Complete and ready for action! 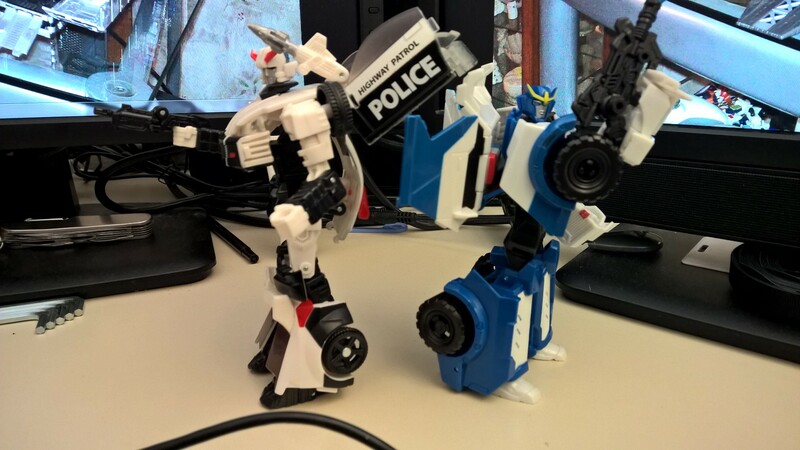 Cops, Cybertronian style. 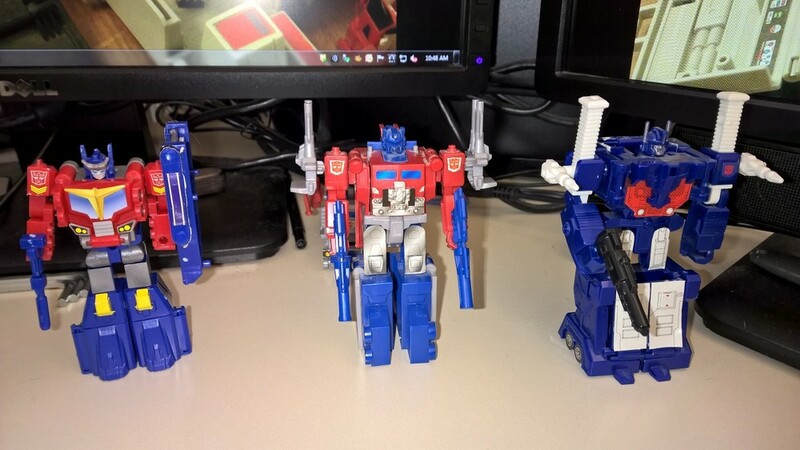 Classics/G1 Prowl on the left, RiD Strongarm on the right. Wonder if Prowl feels bad that the girl has a bigger gun than he does? Doubt it, he never lives long enough to use it. Current city/N scale train setup. 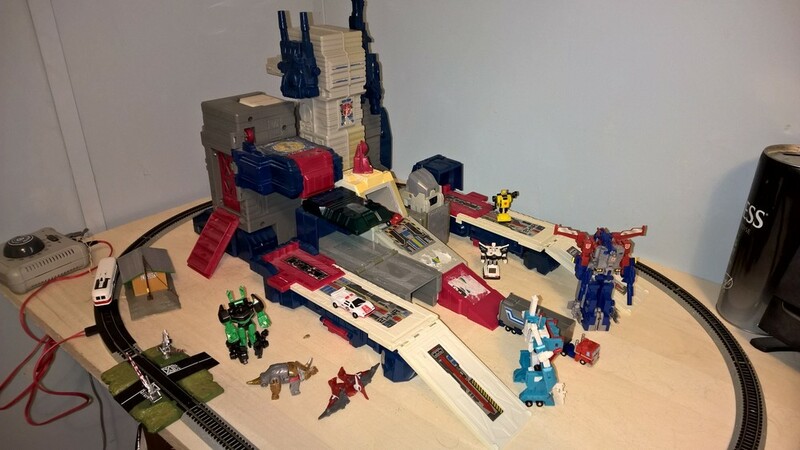 A little more basic, with just my old Fortress Maximus as Autobot City. He needs some new labels at least. I much prefer G1 Metroplex to Fortress Maximus. He seems very 'hollow' by comparison. 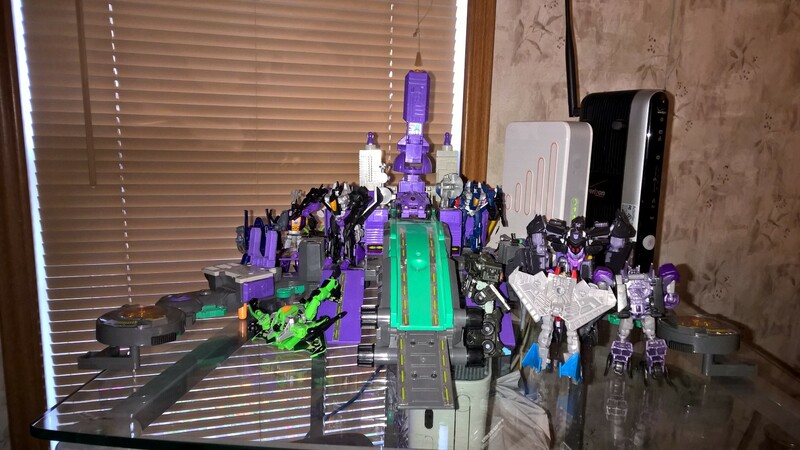 Mine has long since departed from this world but I was tempted by the re-release and did attempt to secure the War for Cybertron edition but was unsuccessful. Anychance you have a G1 Omega Supreme in your collection? I've always wanted one of those. Nope, no Omega. He's on my list to get eventually, but not a priority. I prefer G1 Metroplex to Max as well. 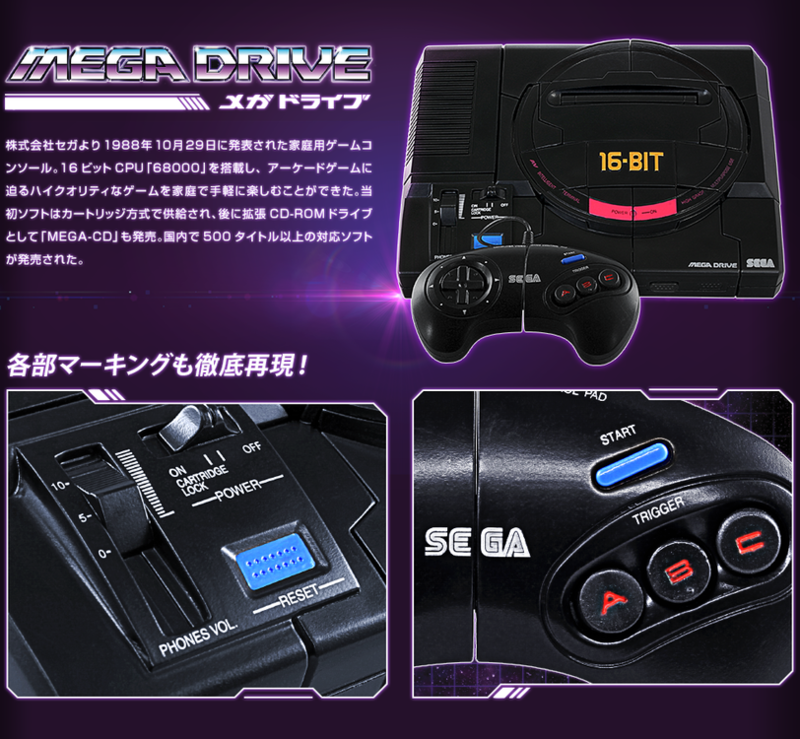 The city mode seems more convincing, and there are so many ways to configure it. The same is true of Classics Titan Metroplex, once I upgraded with 3D printed parts from MegaMoonMan on TFW2005. New transforming hands, ramp extensions so his ramp reaches the ground, improved knees so you can have his leg roadways straight. Well worth the money to add in features the figure should have had in the first place. My main complaint about Classics Metroplex is that his city mode is so big, it's hard to display. It doesn't fit in the N scale train loop I've set up, and I don't have many display areas big enough for it. 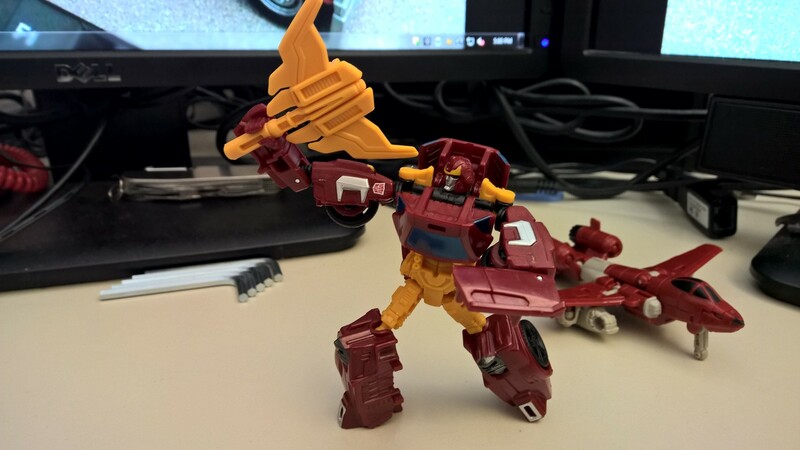 There's a few 3rd party figures definitely based on the FOC character, though. Utopia I think uses some FOC elements in the design. 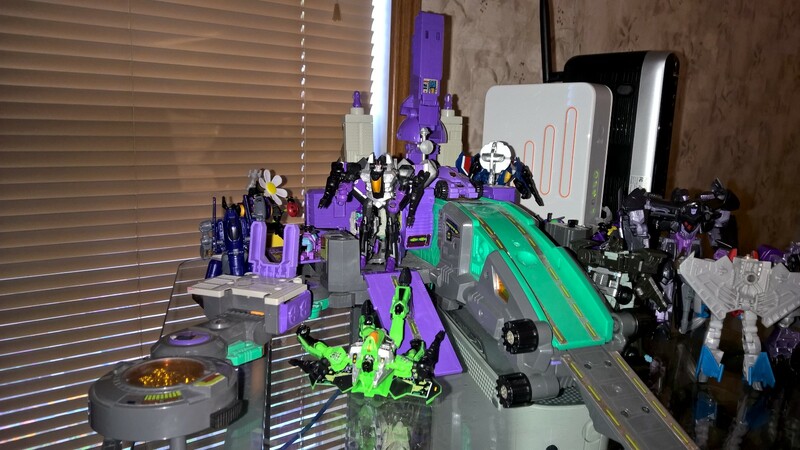 I think they were planning on a 'Masterpiece Metroplex' for a long time then decided to tie it in when High Moon wanted to include him in their second Cybertron game. The Takara version is very nearly a 1:1 match to the in-game model (aside from the slightly too tall proportion issues). 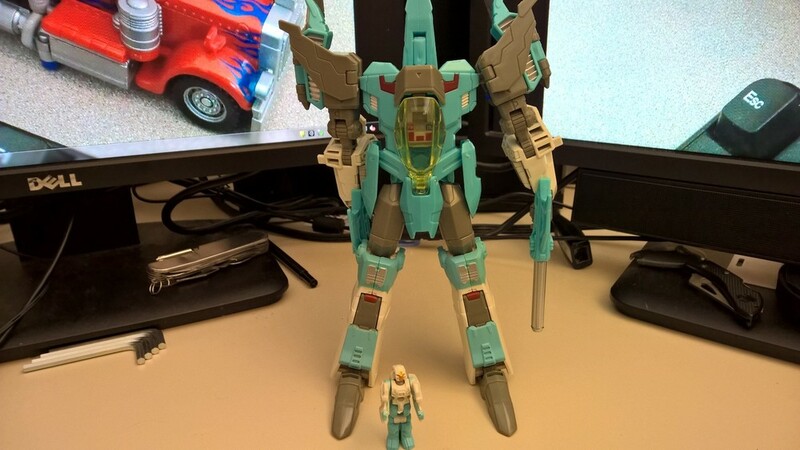 I do wonder if they just made him so tall on purpose to distinguish him better apart from Devestator and the recent combiner wars models. 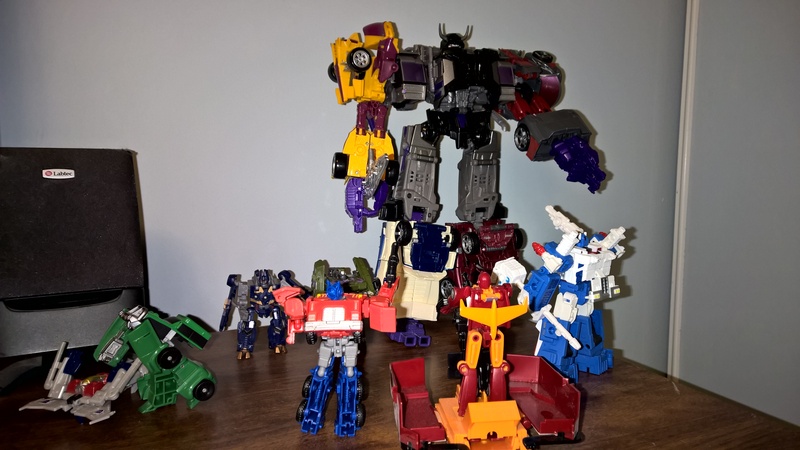 I don't think WFC Omega Supreme was any near as planned or a relation to the previous incarnation though as it's too radicially different (not really in a good way either in my opinion). 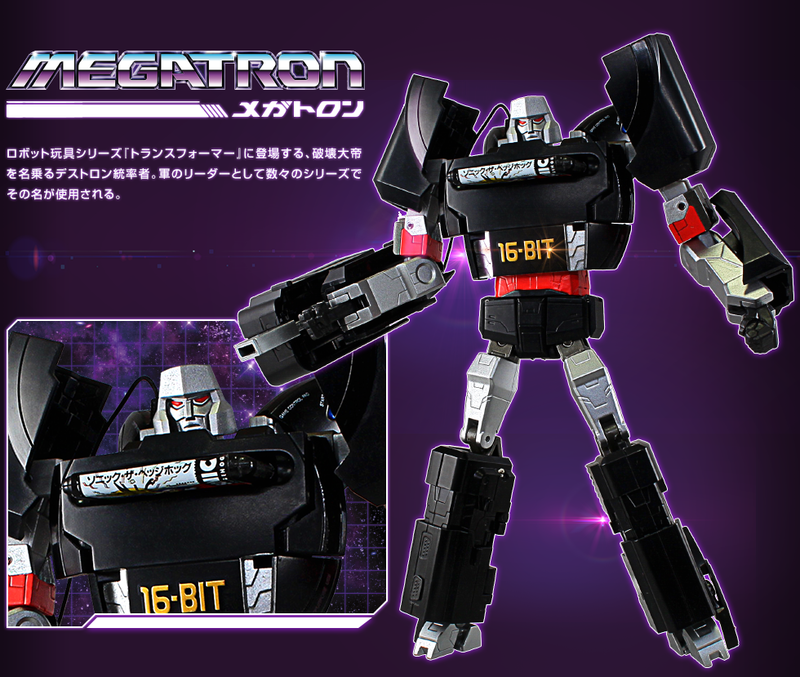 I'm aware the orgiinal Omega toy came from a non-diaclone or microman source similar to Jetfire, so I'm not sure if that is why. 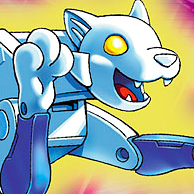 I also wonder if he was going to become a Bayformer, then dropped. 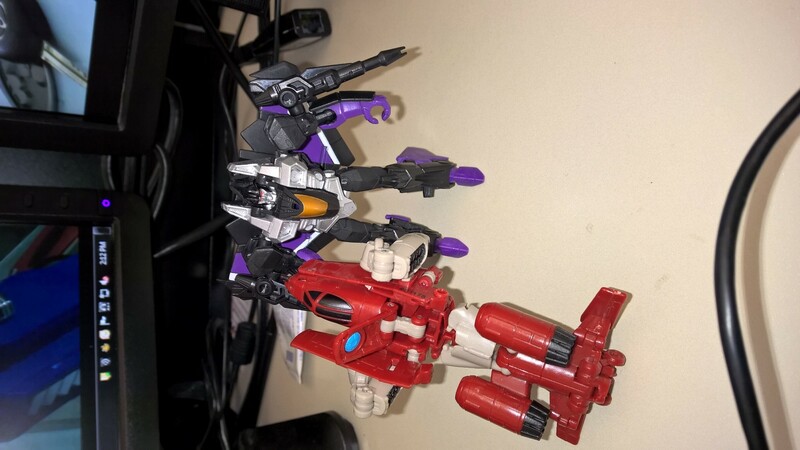 Teaming up with the enemy - Skywarp wields Powerglide in gun mode (which is intended for Superion). 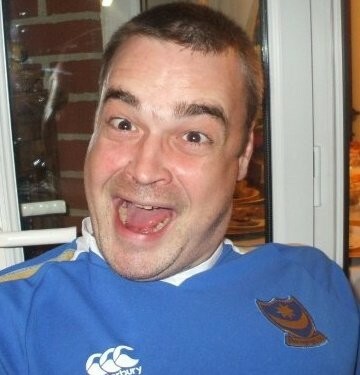 Don't know why it got rotated . . .
Did your G1 head cover come painted/reissue or after market upgrade? Guessing it's a reissue as it's blue rather than turquoise. 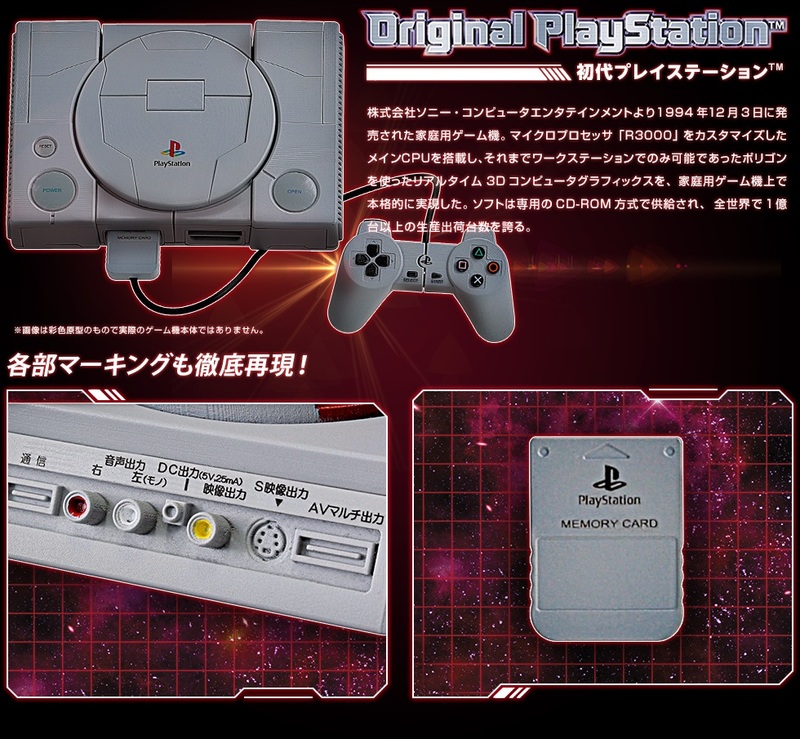 I really want the MP-22 "perfect edition". Nope, it's an original, old enough that the colors could have shifted due to light exposure. Or a trick of the lighting. It was the later all-plastic release with a completely unpainted head - I painted the silver areas myself. I really should pick up some Reprolabels for him. 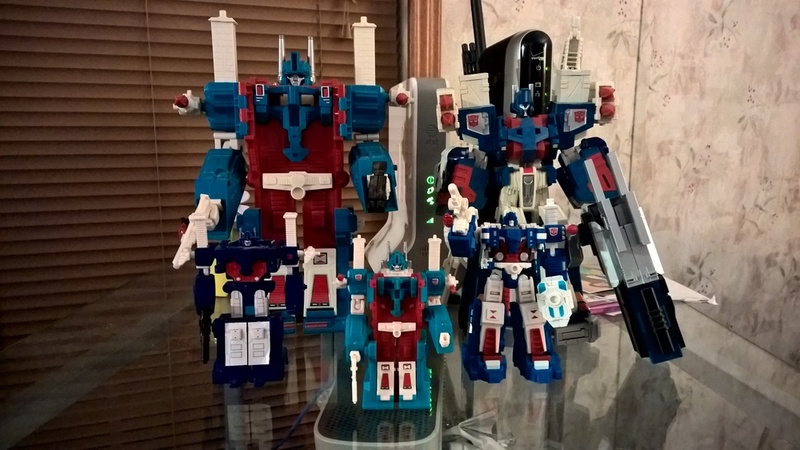 Your mini / WST version looks more accurate colour wise to my old G1's (which is in my parent's attic, so I can't compare). I had two versions of mine; one second-hand and another that was new. The second-hand one was the metal / painted version and the other was plastic-fantastic. Both were the same colour though. 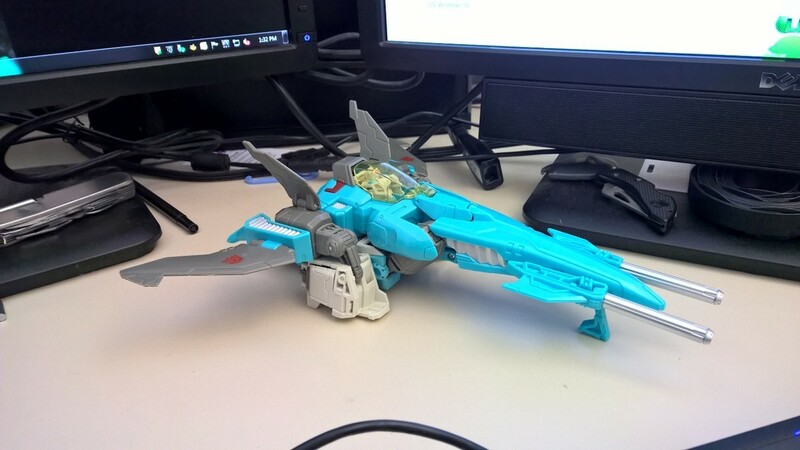 I've only just learned that the forehead crest slot fits onto the chest plate to form a type of vehicle. 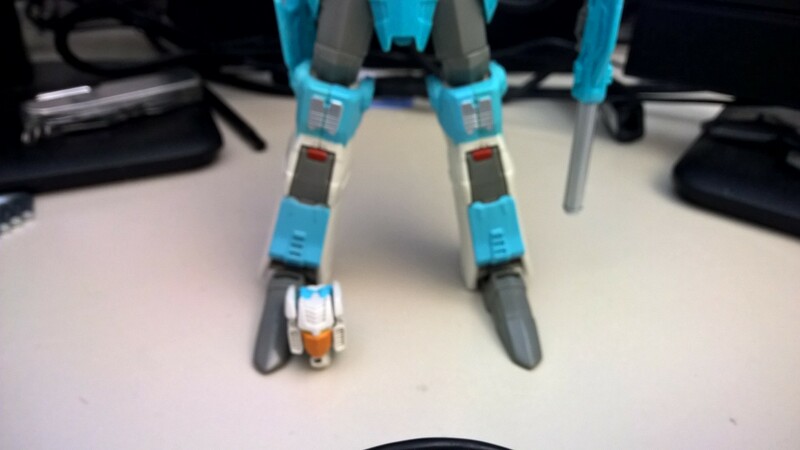 Diaclone Transformers are certainly no short of hidden surprises. True to his bio, Skywarp is being a prankster, to Acid Storm's annoyance! 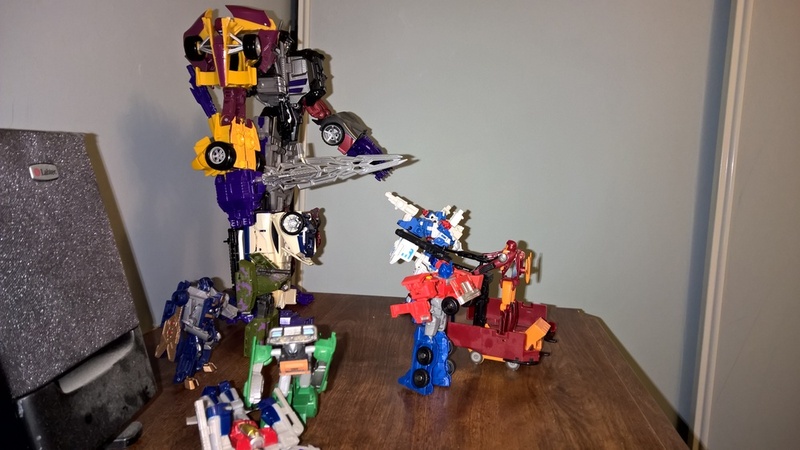 Oh, and Brawn beating up Starscream . . .